The island of Santorini, also known as Thera, is one of the most popular Greek destinations. It is the southernmost member of the Cyclades group of islands, 130 nautical miles South East from the main port of Athens, Piraeus. Its area is approximately 73 km² (28 mi²). Its population in 2001 was 13,670. 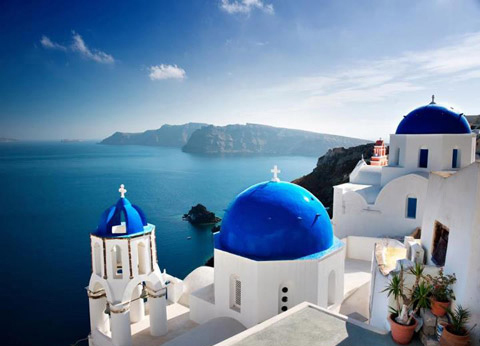 The Capital of Santorini is Fira. Other major settlements include Oia, Emporio, Kamari, Imerovigli, Pyrgos, and Therasia. A major archaeological site with ruins from the Minoan era is Akrotiri. Interesting information about Santorini you can find through the Greek Travel Pages (GTP) and Wikipedia. The port of Santorini is called Athinios. Its coordinates are: 36°23'09.11" N - 25°25'45.75 E.
It is only a few kilometers away from the Capital Fira. There are taxis and buses connecting the Port to the Capital. Near the main square of Fira is the Bus Depot from where one can take a bus to most settlements. The main taxi stand is also by the main Fira square. Conventional ferries: Minimum 8 hours  max 11 hours depending on the vessel and the route. Note: By bus the travel times are longer. Also the road to/from the port is narrow, which means that when ferries arrive, there is traffic to/from the port. Spring ferry season 1st April  beginning of June. Summer ferry season beginning of June  mid September. Autumn ferry season rest of September  31st of October. Ferry connections and schedules for domestic routes, like Santorini, are usually announced by most shipping companies, a couple of weeks before the beginning of each season. There are some exceptions though, like Blue Star ferries, which announces schedules in the beginning of the year. Morning: Daily 1 conventional ferry and at least 2 Hydrofoils. Afternoon: 3 times a week a conventional ferry.